Your mascot and message screen printed on high quality synthetic felt. Available colors are: black, green, gold, maroon, navy blue, orange, red, royal blue, white, yellow. 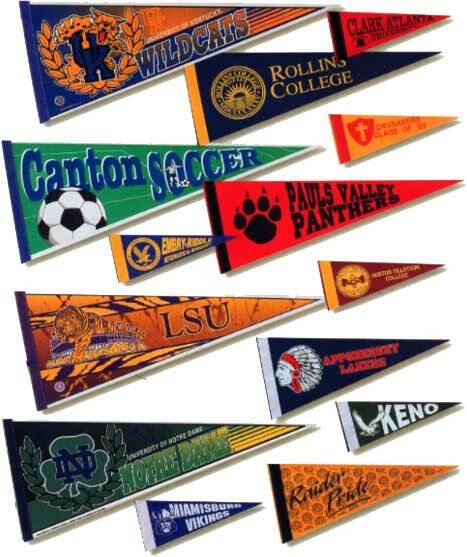 Two color imprint on colored felt 1-6 color imprint on white felt. Available colors are: royal blue, navy blue, red, gold, black, yellow, white. Please describe custom option(s) after adding the product to YOUR CART. A link is provided in your cart to update custom options. Price includes one color on white felt. For colored felt add $.32 per pennant.